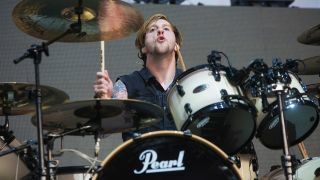 Bullet For My Valentine drummer Michael ‘Moose’ Thomas will sit out the band’s upcoming tour dates to be with his pregnant wife. Thomas has stepped away from the group while he and his wife await the birth of their first child together. His place will be temporarily taken by Pitchshifter’s Jason Bowld. BFMV say: “Our brother Moose got the wonderful news late last year that he and his wife are expecting their first child together, which I’m sure you’ll join us in congratulating them on. The Welsh metal outfit kick off a North American tour tonight in San Diego. They’ll be on the road in the US and Canada until March 7, with Asking Alexandria in support. They return to the UK for six dates in November and December. Bowld has also worked with Killing Joke, Pop Will Eat Itself and Axewound. BFMV released fifth album Venom last year.